In Mitt Romney’s America we may have been deprived of the greatest study of our time: NPR's What Constitutes Being A Bro? Apparently NPR copied my extremely scientific process of pondering life’s greatest questions by just bullshitting with a friend and took it the next step by quantifying it. If my tax dollars are going to go toward research, at least this is information I can understand. I’ll take it. NPR came up with the four crucial components of being a Bro: jockish/athletic; dudely/rolls deep with a posse; stoner-ish/discounted with reality; and preppy/social status. Having been called a Bro once or thrice in my day, I can swing at what NPR is pitching. They pretty much nailed the definition of a Bro. 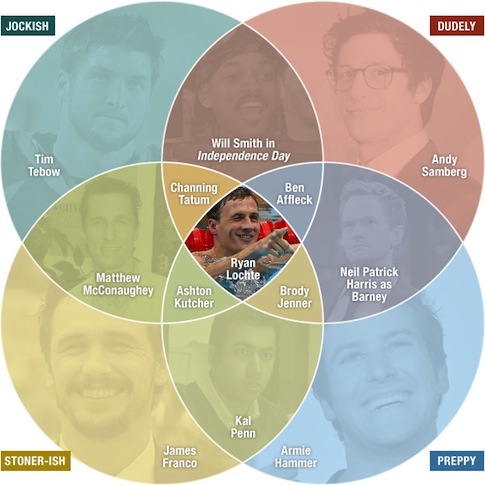 More impressively, NPR’s title-holder of "2013 Bro-iest of Bros" is none other than the Happy/Dumb Warrior, Ryan Lochte. Guess I missed NPR’s submission deadline. There's always next year: "And your 2014 Bro-iest of Bros … Robert Charette!!!" I don’t have too much beef with the rest of NPR’s selection. Although they mention it to recuse themselves, the astonishing lack of diversity in their diagram is alarming. Saying that Bro-ness is only a trait among white dudes is closed-minded and ignores the facts that Bros come in all colors, shapes, and sizes. Being a Bro is a state-of-mind. NPR didn’t need to look far for a deep bench of fine examples of Bro-titude. The entire cast of Fast 6 could be slotted into NPR’s scenario. Tyreese, Ludacris, Han, and Vin Diesel are a cascading cornucopia of exemplary Bro-ness who all could add diversity to the tapestry of Bro-dom NPR has woven. This entry was posted in Uncategorized and tagged Hip Hop, Media, Ryan Lochte. Bookmark the permalink.